In keeping with Chinese tradition and the Philosophy of Regeneration™, daily maintenance of the body with proper nutrition is key to preventing physical malfunction. Dr. Chen created Quinary® as a convenient way to keep the body’s five major systems in balance. * He combined Alpha 20C®, Assimilaid®, Conco™, Lifestream® and Prime Again® into a special, complex formula for Quinary®. 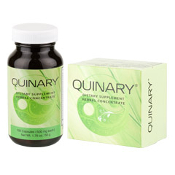 Quinary® supplement helps maintain health rather than waiting for the body to malfunction. It addresses the body's systems collectively as well as individually. Although it is very difficult to achieve with a formula as complex as this one, our blended herbs are maintained without preservatives or synthetic chemicals.